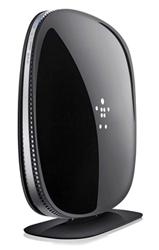 The AC1800 DB router delivers the ultimate in speed and coverage thanks to the latest advancements in Wi-Fi technology. AC Wi-Fi signals travel faster and farther than the current standard and with Belkin's Simple Start installation is easy and quick - just use a smartphone, tablet or computer to set up your router. Intellistream QoS automatically prioritizes video and gaming streams, giving you uninterrupted video streams. Now everyone can stream multiple HD movies and play advanced online games on their tablets and ultrabooks—virtually anywhere in the house. The AC1800 DB operates 4.3x faster than ‘N’ technology with combined speeds up to 300Mbps (2.4GHz) + 1.3Gbps (5GHz)*.. The Dual-Band technology creates independent Media and Standard bands for optimized speed and performance. Exclusive Multi Beam antenna technology minimizes dead spots while optimizing video streaming to multiple devices. AC 1800 DB is backwards compatible with wireless ‘G’ and ‘N’ technology. And it’s easy to set up, thanks to pre-connected cables and the simple startup wizard. The standard transmission rates—300Mbps (for 2.4GHz), 300Mbps or 1.3Gbps (for 5GHz), 54Mbps, and 11Mbps—are the physical data rates. Actual data throughput will be lower and may depend on the mix of wireless products used. Optimized performance for faster and more reliable delivery of online content to your Wi-Fi devices. Get the fastest dual-band speeds for video streaming and gaming-up to 300Mbps (2.4GHz) + 1.3Gbps (5GHz)† for delivering maximum speed to multiple devices. Easy setup in minutes. Brower-based window uses your smartphone, tablet or computer to install your router in just minutes. Belkin’s proprietary Intellistream QoS (Quality of Service) automatically prioritizes video and gaming for uninterrupted high-speed streaming. The standard transmission rates—300Mbps (for 2.4GHz), 300Mbps or 1.3Gbps (for 5GHz), 54Mbps, and 11Mbps—are the physical data rates. Actual data throughput will be lower and may depend on the mix of wireless products used. † The standard transmission rates—300Mbps (for 2.4GHz), 300Mbps or 1.3Gbps (for 5GHz), 54Mbps, and 11Mbps—are the physical data rates. Actual data throughput will be lower and may depend on the mix of wireless products used.